NEW Breakfast Burritos at Pilot/Flying J | Try them FREE next week! 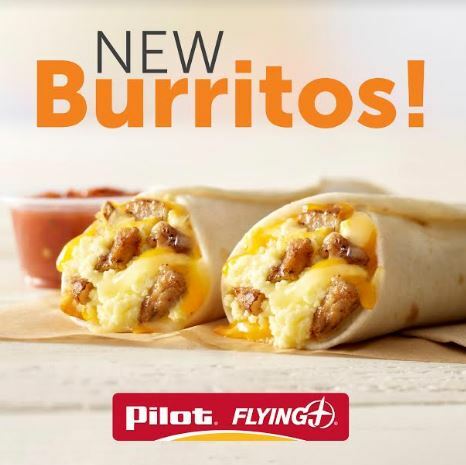 NEW at Pilot Flying/J – Breakfast Burritos! On April 5th, Pilot/Flying J locations are introducing a new breakfast burrito! Starting at just $4 for two, the burritos are made in-house, with flavors including bacon, egg and cheese; sausage egg and cheese; or egg and cheese, accompanied by a traditional creamy red salsa. Monday (Apr. 8) you’ll find an offer in the app for a free burrito + a free Pilot coffee. April 9-14 you can redeem an offer for a free breakfast burrito only. So go get some delicious breakfast!